John McTiernan’s Die Hard ranks as one of my top five favorite movies of all time. Subsequent sequels (Die Hard 2: Die Harder, Die Hard With A Vengeance, and Live Free Or Die Hard) have not been as good as the original but they are still good, fun action movies. The main reason for that is Bruce Willis’ ability to keep the John McClane character consistent through them all. So how does the fifth installment of the Die Hard franchise stack up? A brief introduction to the plot of A Good Day To Die Hard is as follows: When research on the whereabouts of his estranged son Jack (Jai Courtney) is going to be on trial in Russia, John McClane (Bruce Willis) catches a flight in an effort to mend their difference and support his son in what should be a tough time. Upon arrival John finds himself in familiar territory of explosions as he discovered his son was undercover for the CIA in an effort to prevent a scientist from being used in a nuclear heist. But John arrival throws a wrench into the CIA’s plan and now the master of improvised crime fighting must aid his son in stopping the heist. Click here for the trailer. Some thought that choosing Len Wiseman to direct Live Free Or Die Hard was a risky choice but I think that skepticism will most definitely be silenced after what John Moore did with A Good Day To Die Hard. I do not know where to begin to explain all the places that this movie failed. Which is no surprise considering the guy directed Max Payne and Flight of the Phoenix. A good place to star is with the story. It never really explains why now is the time for John McClane to show interest in his son’s whereabouts. Is there something wrong with Jack’s mother or sister? Or maybe John is planning on retiring and he wanted to tell Jack this so they could catch up? No real reason is given. Next when he gets to Russia and he sees his son in the midst of escaping a prison on the run from people trying to kill him John wants to stop and talk but when Jack refuses to talk John obliges himself into bumping bumpers with terrorists on the Russian streets he does not know. Okay the driving in streets he does not know I will let slip because if I nit-picked on that I might as well nitpick on that in just about every action movie. Perhaps the most glaring problem with the story is that the characters are not good. I did not think it was possible but John McClane did not feel like John McClane. He felt like some generic action character. One of the things I liked most about McClane in the previous installments is that you could tell he was improvising by looking around seeing what he could utilize to his advantage. But with this one there was none if that. Him and his son would jump out a window on a without knowing what would be there to break their fall. Which leads me to another character qualm I had with Jack, he is CIA and John is NYPD. Who would you think would call the shots in Russia? Last thing about the story then I will move on is the lack of a villain. When my friends and I left the theater we talked about Willis and the action but when I asked them who the villain was there was a long pause before anyone could think of who it was. Most of the movie there really is not a villain just the McClanes running from bad guys with guns but nothing to hate or fear about them. Story aside, for how well choreographed the action scenes were they were poorly shot. I could not stand the rapid zoom-ins and the snappy editing which is a shame because the car chase in the beginning was very exciting but it gives you a headache trying to piece together the action. As weird as this may sound, the rest of the action was very CGI heavy that gave me the feeling of Moore trying to make this movie too big for its own good. “Too big” is a phrase I rarely use especially when describing an action movie. But when you look at the Die Hard franchise, that have a runtime of over two hours and they do not nearly reach the ridiculous action heights that A Good Day To Die Hard. 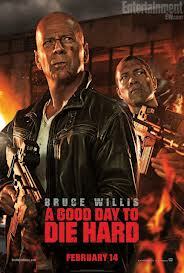 Well I guess Live Free Or Die Hard did but it just a better all around movie with a villain, story, and direction. 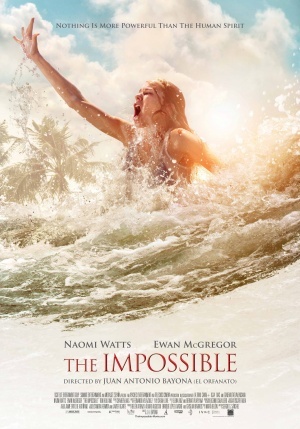 This installment runs just shy of an hour and forty minutes and it shows in the lack of development. I think that is why I would describe it as too big because it all feels rushed to get through the plot just to show some more action. Overall, A Good Day To Die Hard is a major let down. Part of me wants a sixth Die Hard movie so the franchise does not end on such a sour note. It does not feel like John McClane and the frequent old man on vacation jokes get stale quick. I give A Good Day To Die Hard a 4/10 and that is being generous. Steven Soderbergh keeps saying he is nearing the end of his directing days when suddenly his name gets attached to something but as of right now Side Effects appears to be his final directorial piece to grace theaters. The question now is if Soderbergh went out on a good note with Side Effects. A brief introduction to Side Effects is as follows: Soon after Emily Taylor’s (Rooney Mara) husband, Martin (Channing Tatum), is released from prison for insider trading her behavior become bizarre to the point she appears to try to commit suicide by driving her into a concrete wall. While escaping uninjured from the incident she meet a respected psychiatrist, Dr Jonathan Banks (Jude Law), who begin puts her on medicine and meets with her periodically. This prescription however seems to make her moods worse. A co-workers tells Emily about a new drug on the market and after consulting her former doctor, Dr Victoria Siebert, Dr Banks write her this new subscription that causes her to sleepwalk and commit a heinous crime that puts Emily and Dr Banks in trouble with the law. Click here for the trailer. Side Effects tells an interesting story with a lot of tide changes. At first you feel very sympathetic for Emily. She is in a troubled place emotionally as she ponders what awaits her when her husband gets out of jail and starts talking about opportunities to get back to where they once were financially. She is happy Martin is back in her life but you can see the passion is not quite what it was at least under Dr Banks who comes off as arrogant and influenced to diagnose patients to take a new prescription drug that is offering him money to test on patients. I will not give away any twists but it is amazing to see the reversal in circumstances and the audience goes from pulling for one character to start to hope for their downfall then the one you were suspicious of becomes the actual protagonist. I will be the first to admit that I do not like most of Soderbergh’s films although I do like the way they are shot. To be honest I cannot pin point why. But I have always liked his choice for camera angles where you are almost always looking up at the characters during dialogue. That may sound like a weird thing to appreciate but it keeps me more focused on the character and does a better job of what the actors are trying to bring to the scene. The acting is so-so at best. 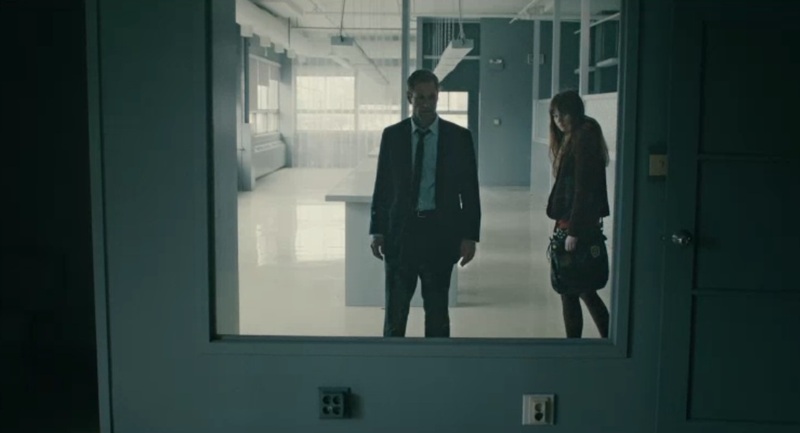 Rooney Mara tip-toes one being overly subtle or bland with Emily’s emotions in the first half of the movie. Half way through the movies I thought that could she really be playing this role that plain but the second half of the movie is where she shows the talent she displayed in The Girl With The Dragon Tattoo. Jude Law is phenomenal as always the whole way through the movie. He nails the arrogant and secure doctor that at the flip of the switch he becomes relentlessly vengeful and paranoid. As for Tatum, there is not a more popular actor today that could deliver his lines more flat especially here in Side Effects. As for Zeta-Jones, I could not see much of her acting behind those ridiculous giant framed glasses. Overall, Side Effects delivers what most Soderbergh will expect of a taut dramatic thriller. As someone who is not keen on of his movies usually, I was plessantly surprised by how good of a thriller it was but I still had my issues with the pacing and chopping editing. I give Side Effects a 7/10. Zombie movies to this point have been action movies, horror movies, even comedies but with the release of Warm Bodies we can add romance movies to that list. Guess we should have seen this coming after all the Twilight movies that took iconic horror characters, vampires and werewolves, and had them fall irrationally head-over-heels in love with a human. 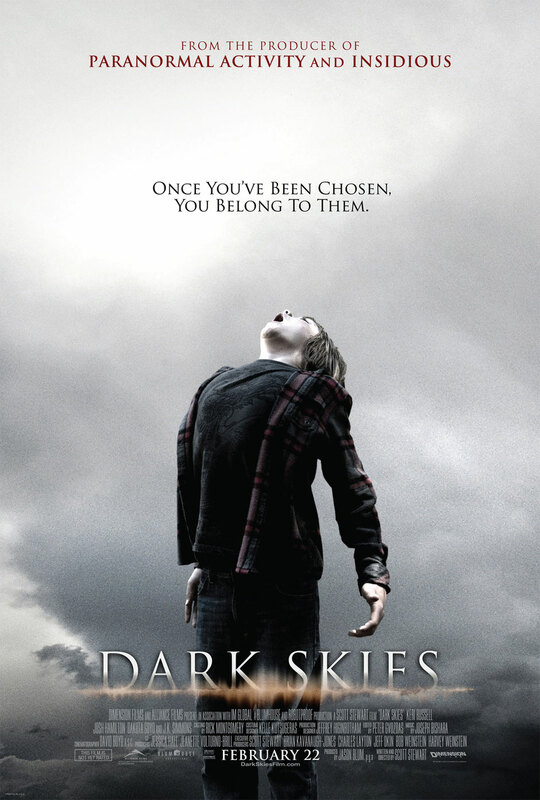 Well unlike the Twilight movies, at least Warm Bodies recognizes the fact that it is a comedy. A brief introduction to the plot of Warm Bodies is as follows: A zombie simply named R (Nicholas Hoult) has been a zombie for he does not know how long and neither does he know how he become one or a life before being a zombie for that matter. On a hunt for food R and other zombies stumble upon a group of teenagers gathering medical supplies for the few still living in militaristic seclusion. While eating the brains of one of his victims he has a vision (the memory of the victim) and falls in love with Julie (the victim’s girlfriend). R rescues Julie (Teresa Palmer) from an attack and takes her to his new home, an airplane decorated in music memorabilia. This spawns a journey that slowly makes R become human again. Click here for the trailer. Hands down the best thing about Warm Bodies is in the writing. R’s narrative both for storytelling purposes as well as comedic relief made the movie as enjoyable as it was. Since he cannot verbally communicate, his thoughts offer some interesting insight to the mind of a zombie. Wandering aimlessly around at snail pace with nothing to care about other than when his next meal will be, explaining the differences between his breed of zombie versus the boney’s, and wanting to say/do the right thing to impress a girl he just met was done with a lot of wit which I appreciated. I just wish the romance has been as cleverly written. If you have read my Safety Not Guaranteed review you know that romantic comedies are not my favorite genre simply because a lot of them are over the top “romantic.” What I mean by that is the ninety percent of the time they are too lovie-dovie and sappy. Warm Bodies straddles the line of having a sappy/cheesy beginning. R sees Julie and his heart gives a single beat of potential life. Initially it came off more lustful than love which a lot of movies fall victim to. R lusted for Julie when he knew nothing about her but that changes as he got to know her later by eating more of her boyfriend’s brain (clever concept by the way). By the way it bothered me a little when I thought she was completely in love with her boyfriend Perry but does not dwell on him for long on his death. This illustrated a character flaw I found in Julie. Julie I found to be difficult to like. I completely see how R could have lusted for her since Teresa Palmer is a pretty lady. But the fact that she was not hung up on the boyfriend she loved being eaten alive foreshadowed a decision she makes later. The part I am talking about is when Julie and R had broken in the suburban home and Julie invites R to sleep upstairs with her but tells him not to look as she changes out of her wet clothes. Naturally he cannot help but look even though as a member of the living dead I doubt he would have been able to get it up. Then the next morning she ditches! Next we see Julie confessing to her friend that she regretted leaving him but takes him in when he shows up outside her window. Two questions popped in my head (1) why did that not creep her hell out? And (2) how could R want to pursue her after she had led him on like that? It made little sense to me. Maybe the reason I feel that way is I felt bad for R was because he was played brilliantly by Nicholas Hoult. You saw on the outside he was like any other zombie but the inner dialogue and subtle facial tics showed he was doing his best to change what was left of life in his body. Other than him most of the actors could have been easily replace. Not to say they did a poor job but it was nothing special. Palmer was a much better love interest than Kristen Stewart but I don’t think she brought anything to her character that other actresses could not have. Sadly I felt the same way about John Malkovich as her military leader father. The movie was a horror/comedy and Malkovich has proven how funny or scary he can be depending on the role but he did neither in his role. He was just stern and stubborn, a waste of his talent. I should also note Rob Corddry and Analeigh Tiption were solid in their roles as the friends that questioned the legitimacy of the protagonists love but did their best to support it. 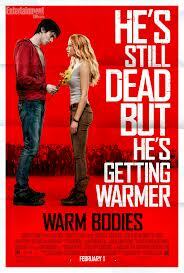 My final thoughts on Warm Bodies are that it is worth a watch simply for Nicholas Hoult and the witty take on the zombie way of life. I was not completely sold on the zombie romance of that love concurs all and brings them slowly back to life but it has its cute moments. I give Warm Bodies a 6/10.